Panthers are bearing the fruits of success again – after retaining the SGB Championship Fours. The city club’s victory in the annual event is a tale of grapes, a gazebo and glory as they put their second-tier rivals to the sword at Redcar last Sunday. Panthers arrived in the North East as defending champions after a memorable triumph on home shale at the East of England Arena – the traditional Fours stage – last summer when blowing away the competition despite fielding a depleted team. Turn the clock forward a shade under 11 months to a new venue at the Media Prima Arena, a new format that saw all 11 teams involved in the same qualification system and a very different Panthers quartet . . and they reigned supreme again. Ulrich Ostergaard, the only survivor from 2017, was joined by seven-time British champion Scott Nicholls, in-form Michael Palm Toft and New Zealand champion Bradley Wilson-Dean on this occasion. They topped the standings after the qualifiers and then came through the pack with a well-timed challenge in the final despite only providing the winner of two of the 12 heats. There’s very little that Nicholls hasn’t achieved in more than 20 years in the sport, but the 40 year-old was clearly impressed with the attention to detail of the Panthers camp. He said: “I think it may have been my first time in the Fours. It’s one of the major events in British speedway and we wanted to win. “There is no way this Peterborough team ever turn up at a track to go through the motions. “The promotion try to do things properly and a lot of thought goes into their preparation. “You could see that on Sunday when they brought a gazebo to give us shade, loads of bottles of water and even chopped fruit for us. 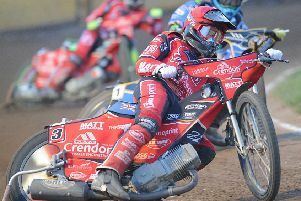 Nicholls was not quite so impressed with his own performance as he failed to win any of his five outings – two in the qualifiers and three in the final – but his solid scoring was a factor in Panthers’ success. Palm Toft and Wilson-Dean both recorded back-to-back wins in the qualifying heats when every rider had two outings. Ostergaard and Nicholls contributed three points apiece at that stage. Palm Toft was their leading man with seven points from three rides in the final. Nicholls bagged six, Ostergaard recovered from a first-ride spill to earn five and Wilson-Dean managed four. That added up to a 22-point total as they beat runners-up Edinburgh (19), Glasgow (17) and Lakeside (14). Nicholls added: “I really like the track at Redcar but I struggled with the set-up. Ellis Perks acted as the club’s reserve to bring his short-term stay with the club to an end, but he wasn’t required on track. Panthers will now bring Emil Grondal back into their side following a spell out injured after a frightening crash in Denmark which left him with a pelvic fracture and punctured lung.